The Bodyguard, the award-winning musical based on the blockbuster film, is heading on tour in 2018. A breathtakingly romantic thriller, The Bodyguard features a whole host of Whitney Houston’s greatest hits including Queen of the Night, One Moment in Time, Saving All My Love, I’m Your Baby Tonight, Run to You, I Have Nothing, Jesus Loves Me, I Wanna Dance With Somebody and one of the greatest hit songs of all time – I Will Always Love You. After mesmerising audiences in London and theatres around the UK for five years, the show takes up residence in Glasgow’s Theatre Royal for almost the whole of December. 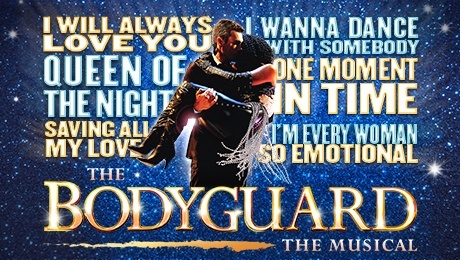 A hugely popular show, these tickets will sell like hotcakes, so don’t miss your chance to see The Bodyguard in Glasgow! Based on the Warner Bros. film written by the acclaimed, Oscar-nominated screenwriter Lawrence Kasdan, with a book by Oscar-winner Alexander Dinelaris, this extraordinary production has been dazzling audiences around the world.